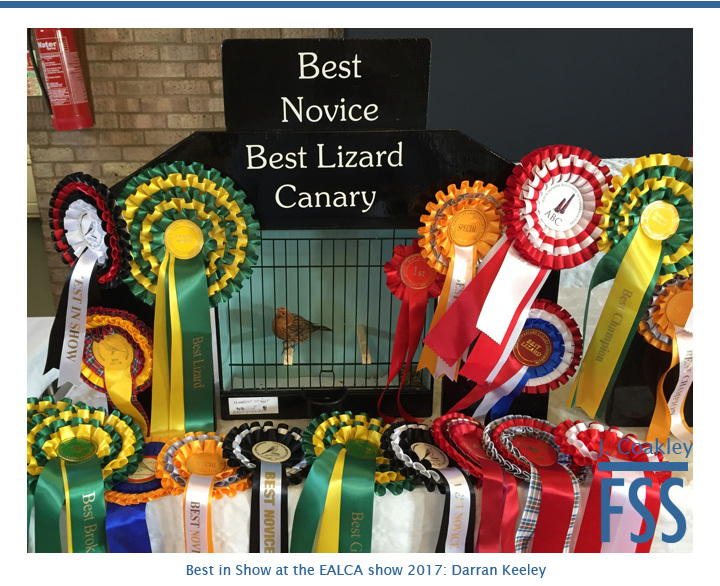 Traditionally, the East Anglia Lizard Canary Association show is the first of the major Lizard shows to be held each year in Great Britain. In the late 1980s and early 1990s, it was second only to the National Exhibition in importance. Thereafter, a decline in the number of breeders in the region, and the rise of the LCA Classic and other Lizard shows, has seen it slip down the league table. It still remains an important event in the calendar though, and the initial reports of this year’s show were positive: the number of birds exhibited was up; the quality (especially amongst the Novices) was good; and the organisation of the show was excellent. After the LCA Classic, people were even telling me that the EALCA show was the Lizard show of the year. It was as though the clock had been turned back 30 years. In 1974, I purchased my first Lizard Canary from Bob Rainbird a charming man of Ipswich and a founder member of the EALCA; the bird was a cobby silver broken cap hen. I admired the bird as soon as I saw it, this started me on the road to my love of the Lizard Canary. In 2016 I was sitting in attendance at the EALCA AGM when the role of Chairman came up for election. Mindful of my visits to Bob and his contribution to the EALCA, I left the 2016 show duly elected Chairman. At the start of 2017, armed with my observations of visiting shows in Europe and the UK, I sought to uncover new ways of producing a show and to affirm how truly ‘their fate is our fate’ if we want to continue, and most importantly, to admire the wonderful Lizard Canary on the show bench for future generations. The complete theme of this show would revolve around freedom, and a fresh no-holds-barred format, forget the rules to a point, and enjoy the day. Exhibitors and guests would be able to roam the venue at their leisure; view the Lizards on display prior to judging; check on their birds whenever they wanted; and most importantly, have discussion on the finer points of their Lizards with their counterparts. There were 140 Lizards entered from 15 exhibitors, 8 Champion 7 Novice, for judge Brian Jay to adjudicate. Novice Exhibitor Darran Keeley swept the board as the Novices continue to gain ground in recent years over the Champion exhibitors. Darren Keeley took Best Lizard and Best Novice with a Gold Hen Patch Cap; a nice type small bird with good all round clarity of spangle/rowing. Second Best Lizard and Best Champion went to Stan Bolton with a Gold Nearly Non Cap hen; just down in colour to achieve Best. Third Best, Best Silver and Points Trophy winner was Andy Williamson’s Non Cap Silver hen; another bird that could have taken best, but again just lacked in colour and tightness of spangle. Continuing his sweep of awards, Darran Keeley took Fourth and Fifth Best respectively with a dark Non Cap Silver hen with good colour, but just lacking the leading birds in breastwork; and a Gold Nearly Non Cap again just lacking in breastwork to push it forward. Further exhibitors with birds of note were David Newton, Tony Horton, and Danny Higgins. These pictures tell my story and those guests/exhibitors that attended will tell theirs; you can now tell yours! Just click on any photo in the gallery to view a larger version. My thanks to Joe for his informative report and his excellent photographs. Now that people can see what is on offer, I have no doubt that next year’s event will be even more popular. the Best lizard show of the year by a country mile . A completely impartial view, of course! really liked the new format regards staging,the guys who run the ealca have done a super job. It truly was a fantastic day! Well done to Joe Stan and Andy for all the hard work and putting on a great show. Hi from Portugal. Very nice show. É muito gratificante ver a raça Lizard fortalecida em seu país de origem. Pelas fotografias é um encanto a qualidade dos exemplares expostos e pela clareza do julgamento o resultado foi justo. Aqui, no Brasil, a raça se fortalece com a entrada, já faz mais de dez anos, das melhores linhagens do mundo, inclusive inglesa, e em nosso campeonato nacional expomos cerca de 550 Lizards. Aguardo, muito em breve, ingleses nos visitando.